I fell in love with this polish when it came out, so when I finally scored it on the clearance rack I was stoked! I have pics from in the sun and in the shade in an effort to show off the glory of it all. China Glaze It’s a Trap-eze! is a white polish with metallic glitters mixed into it. It does remind of me Jawbreaker by Funky Fingers, but I feel like the formula is better. 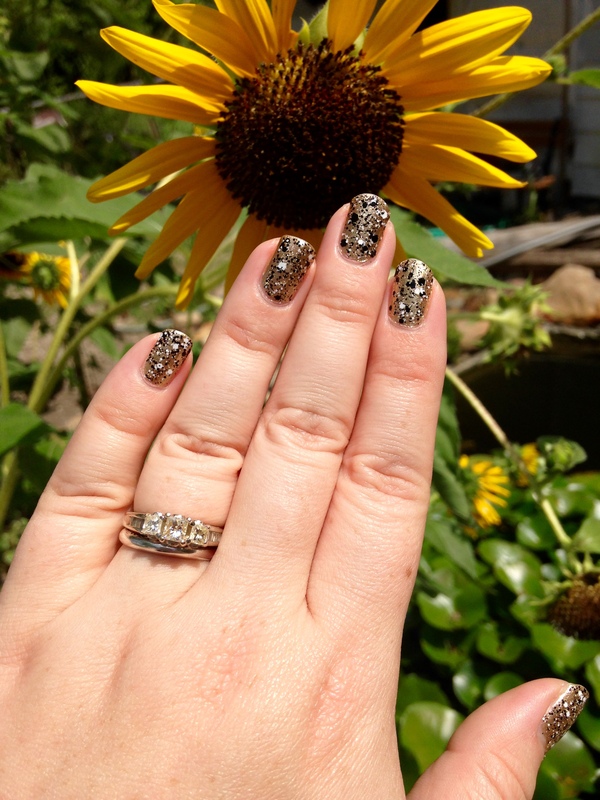 Check out the shine from the glitters on my hand! 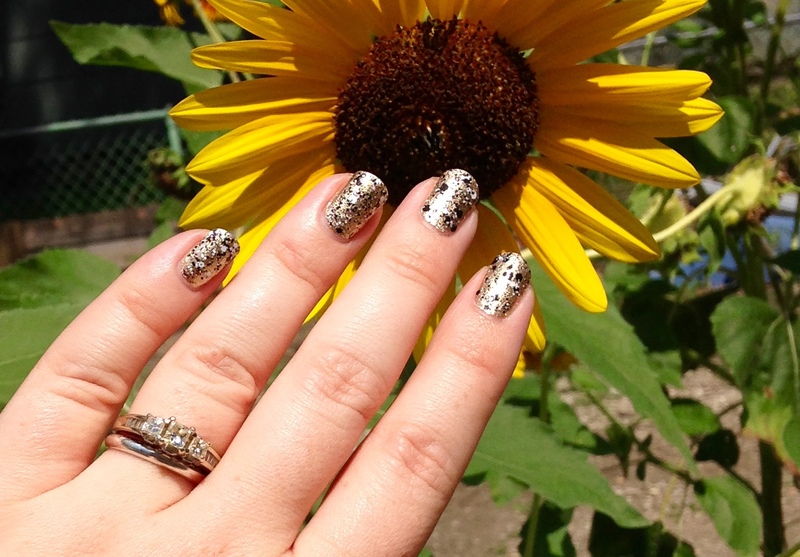 When this polish catches the light, the metallic pieces really do shine. 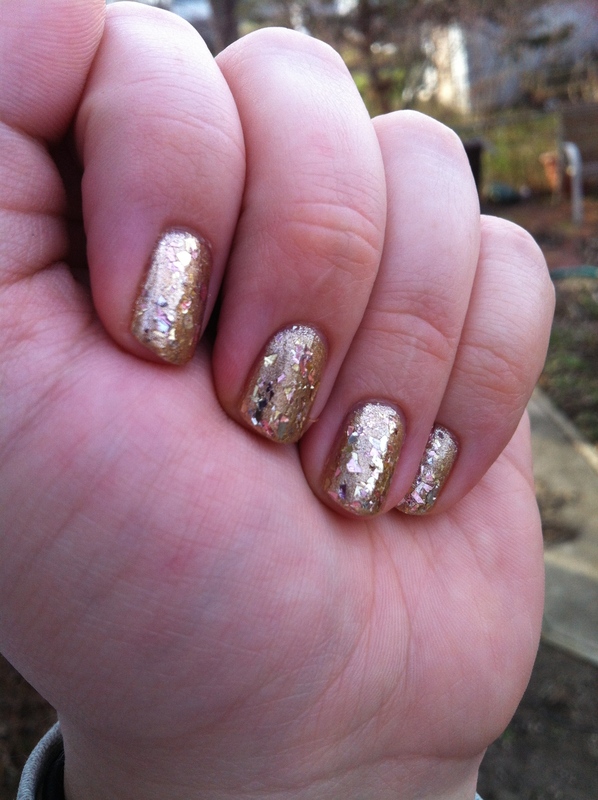 Because of the glitter pieces, this polish does have a bit of a texture to it. Also, in spite of the glitter, it goes on pretty easily. I think this is such a fun, versatile polish. I am super excited to have it in my collection! So, this summer has been full of ups and downs, and super inconsistent posting. But, I am proud to announce a shift in my career. Last Friday I was hired, started on Monday, and I feel it is going to be a really positive move in my life. Because of the time crunch and the hard work, a simple paint job for my nails was necessary. I decided to go with the colors of the new school I am at, with some black and gold. 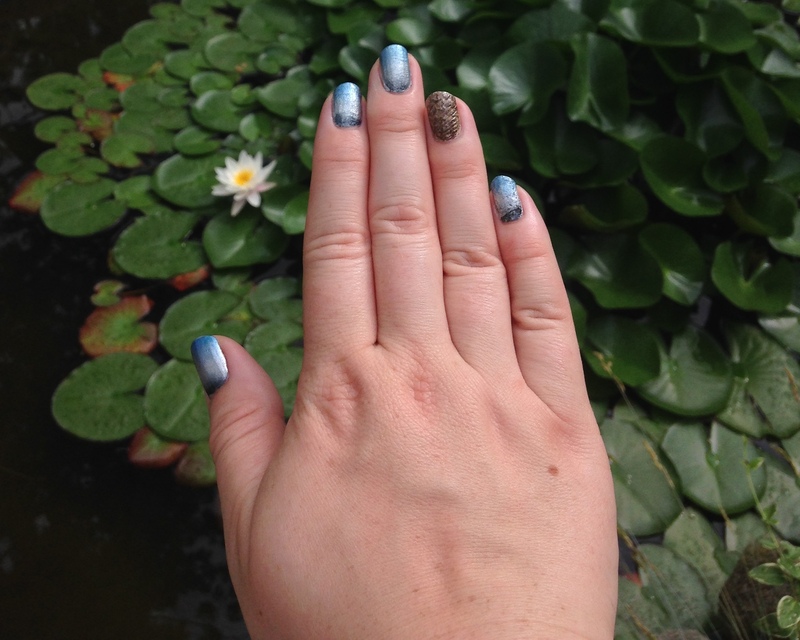 These were the only two polishes needed for this simple, shiny mani. 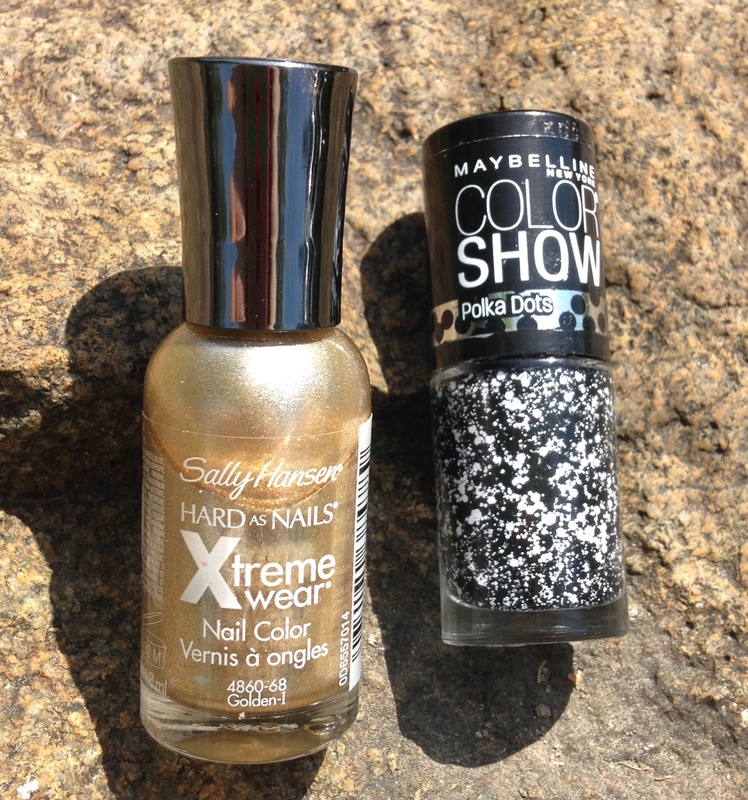 I began with two coats of Sally Hansen Xtreme Wear Golden-I on all of my nails. 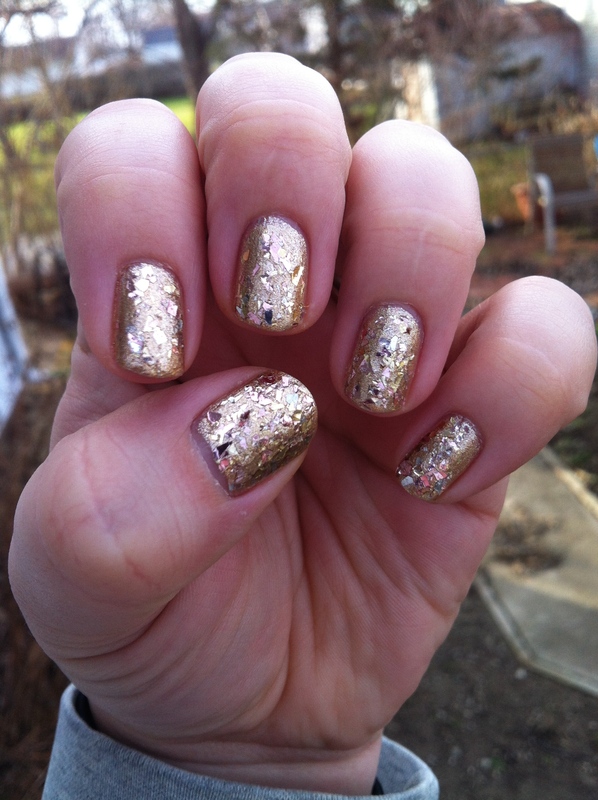 This is the most beautiful gold polish I have ever used! It goes on easily and is very metallic. Then, to get the black (and a touch of white) on there, I topped off my nails with Maybelline Color Show Polka Dots Clearly Spotted. This is another fave of mine. It’s hard to tell in the pic, but the bottle is half empty, and when it is all gone, I will be sad. The finished product was fast and I liked it. It was a good way to sport some new school spirit on the job for the first week, too. 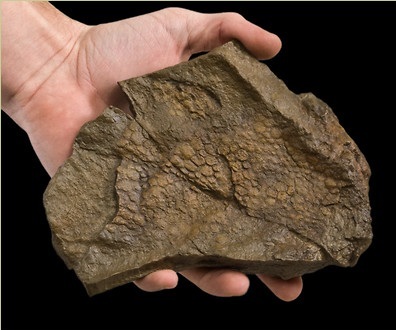 I am an embarrassingly huge fan of all things Jurassic Park! The first one is great, the second one is watchable, the third one is junk, but I still watch it. 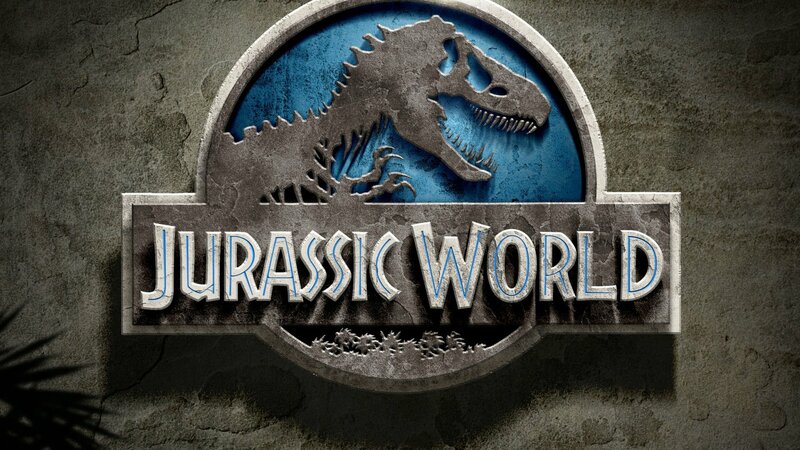 I got to go see Jurassic World when it opened this weekend, and had a great time! I am not going to try and act like it is a brilliant piece of cinema…I can tell you that it isn’t. 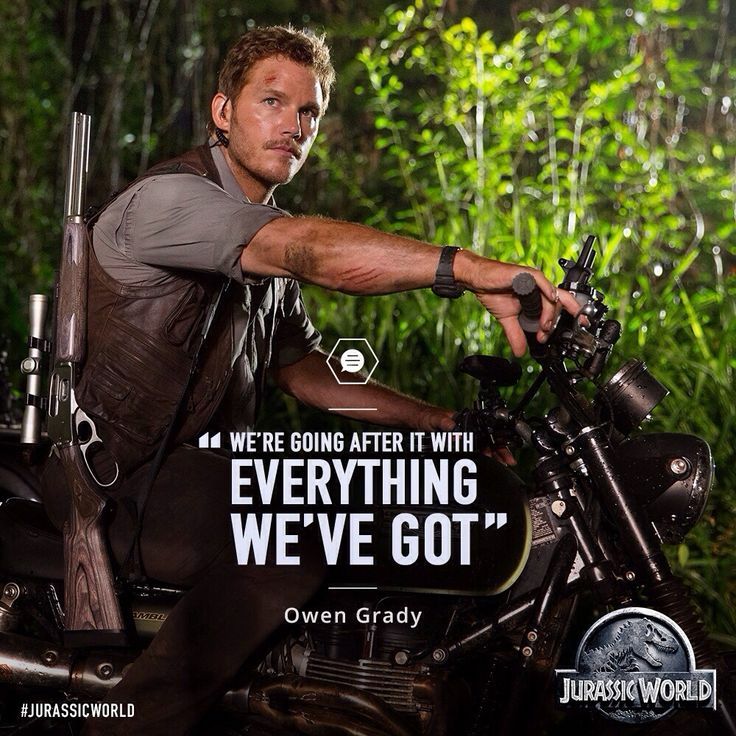 But if you are going to jurassic thrills, you will not be disappointed! I searched a few images for inspiration before I began. I did not want to go with the red, yellow, and black colors from the original movie. 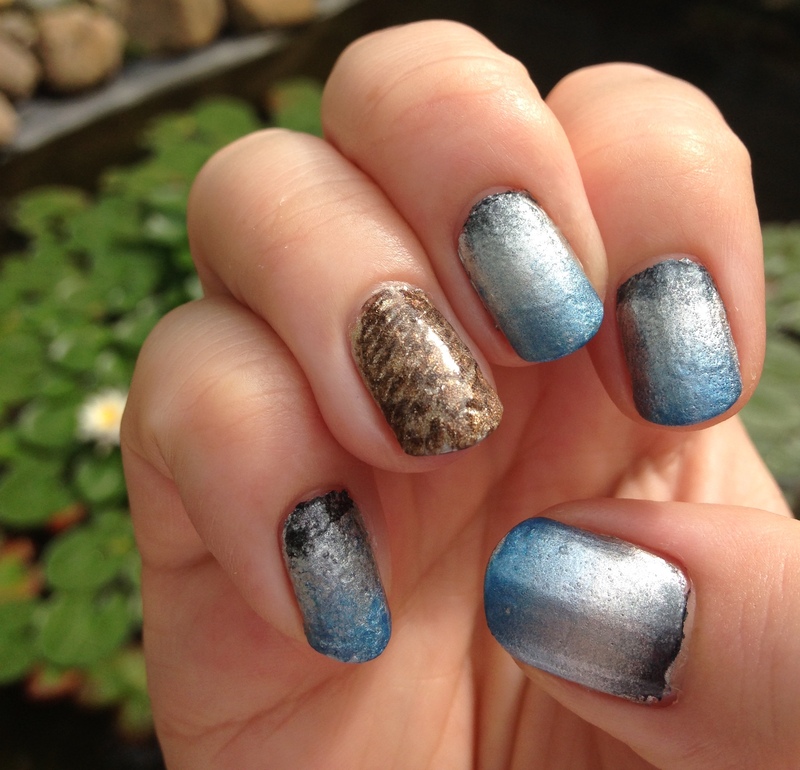 I liked the blue, black, silver theme for the new one. 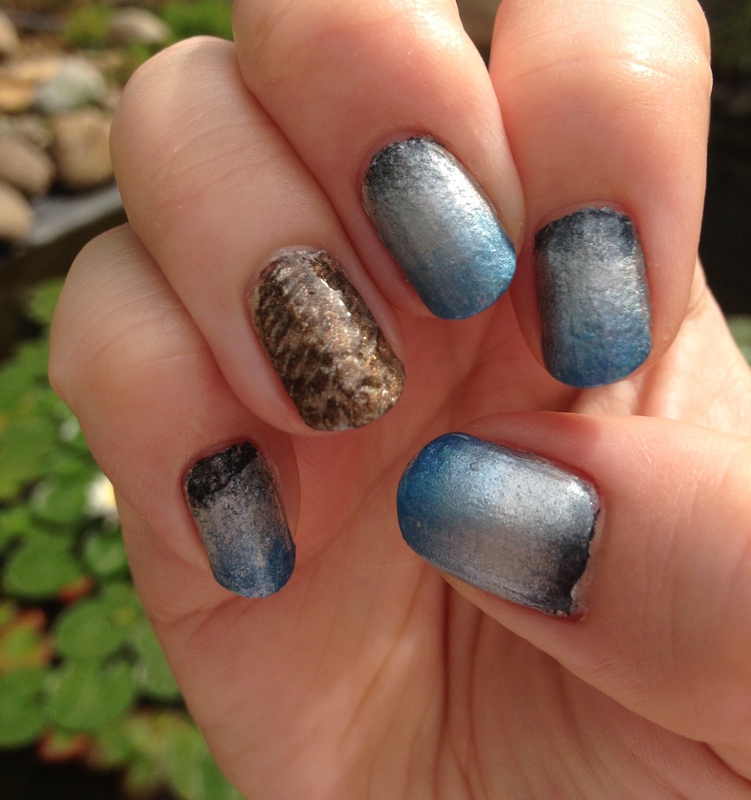 And, the fossilized dinosaur skin inspired the accent nails. After this, the work began. Get ready, because this is going to be quite the post. I used all kinds of supplies for this mani. I will begin with the ones that are not nail polish. 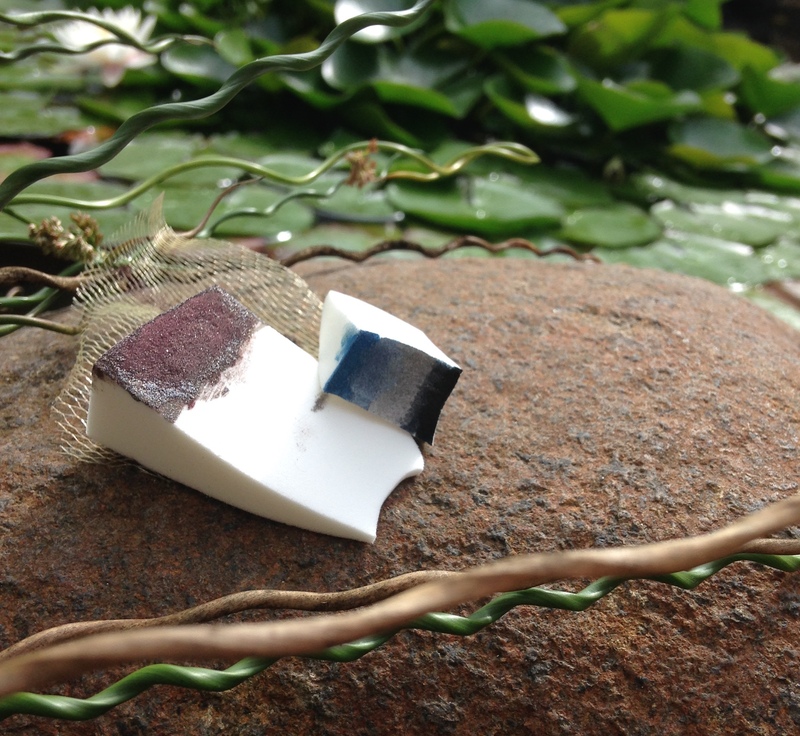 I used a bath scrunchie (new), cosmetic sponges, glue, and a paintbrush. I used the sponges to do the gradient and accent nail, the scrunchie for the accent nail, and the paintbrush to paint the glue all around my nails to make clean up easier. 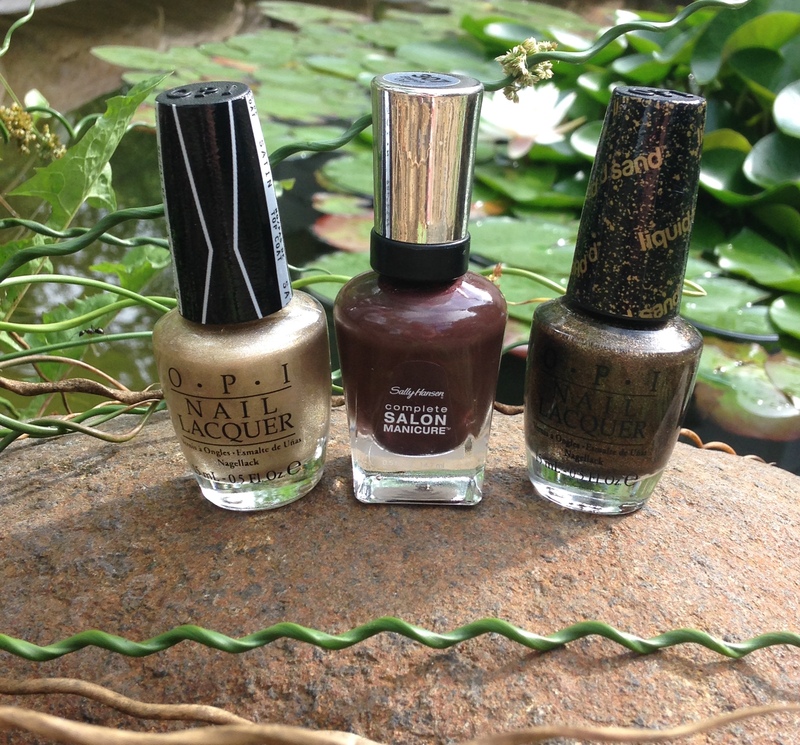 For the gradient on my nails I used these polishes. 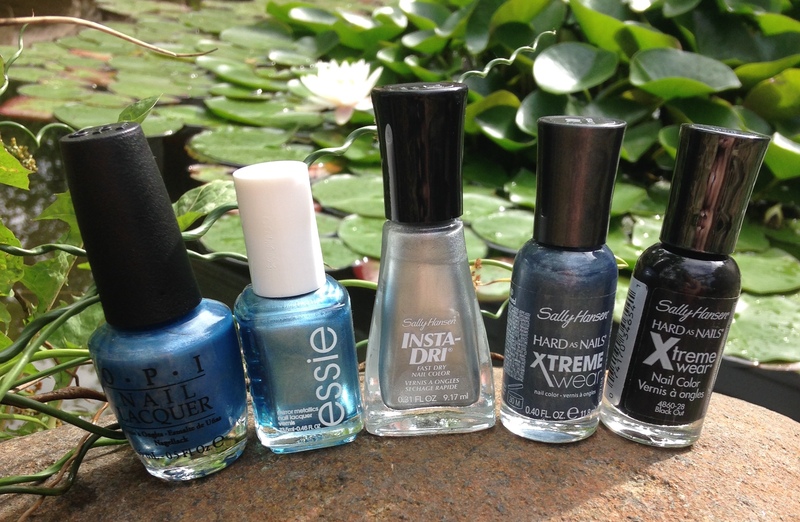 From left to right: OPI Dining Al Frisco, Essie Blue Rhapsody, Sally Hansen Insta Dri Silver Sweep, Sally Hansen Xtreme Wear Gunmetal, and Sally Hansen Xtreme Wear Black Out. Before I sponged on any paint, I did one coat of the Insta Dri on all ten of my nails. 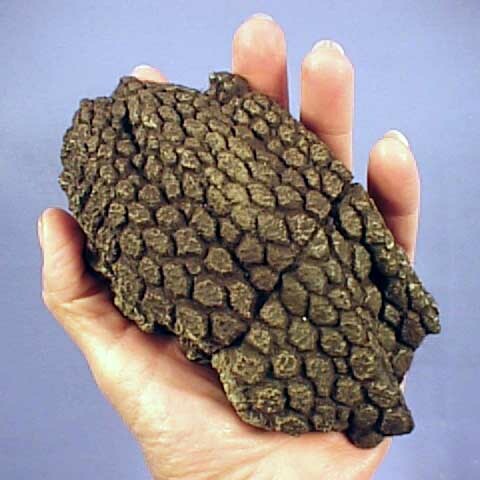 Then, I cut a sponge to be about the size of my nails, painted it in the order that you see, and dabbed away. 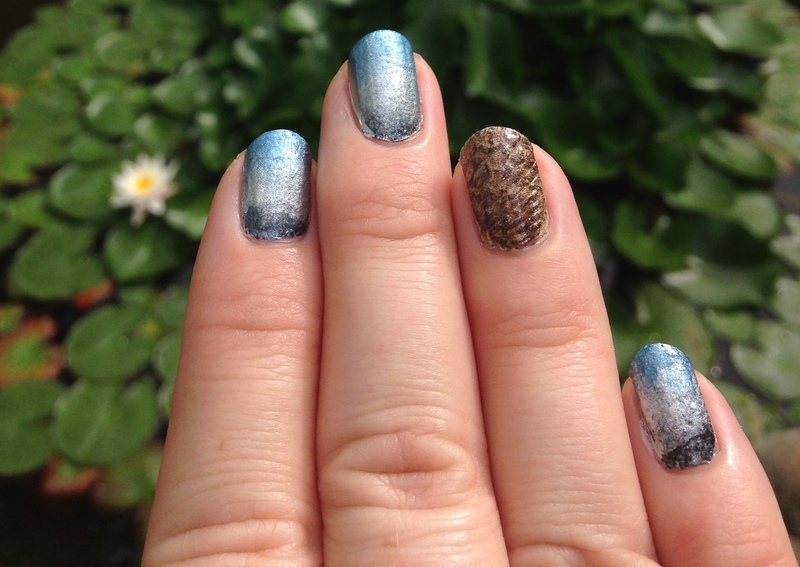 Because I was going for the Jurassic World theme, I was not overly concerned with perfection. It was okay to see it get a little rough in texture and to not have all of the gradients have the exact same amount of blue or black. 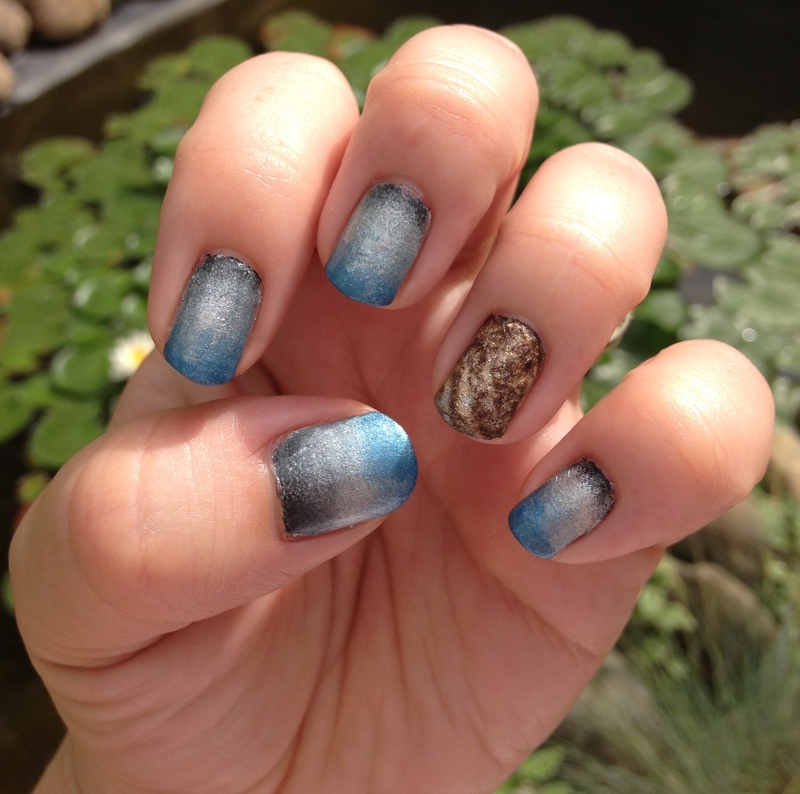 For the accent nails I used brown and gold colored polish. From left to right: OPI Satin Love.Angel.Music.Baby., Sally Hansen Complete Salon Manicure Branch Out, and OPI Liquid Sand What Wizardry is This. First, I put on two coats of the satin finish polish. I purposely chose that so I wouldn’t have too much of a shine. 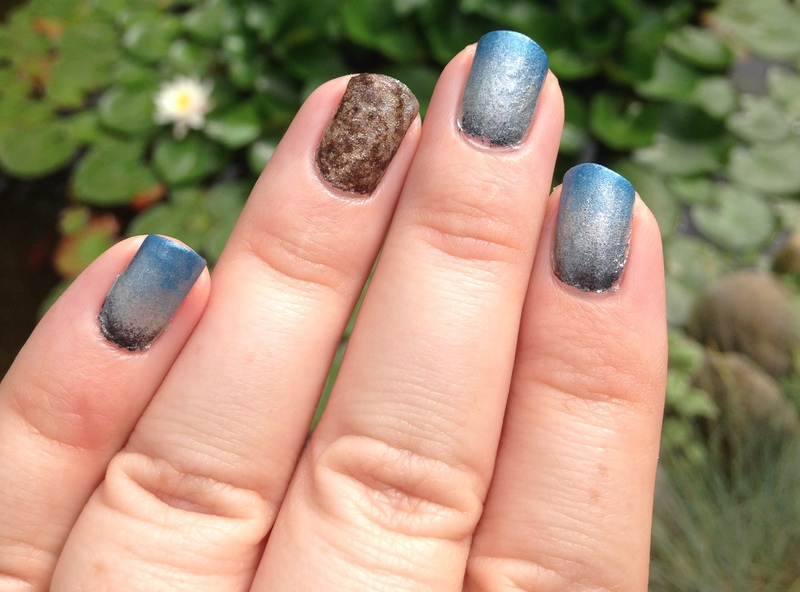 Then, using a cut off piece of the bath scrunchie, I held in on my nail as I sponged on the other two colors. Before I lifted the netting of the scrunchie off, I pulled on in a little to get a rough, textured look. The liquid sand polish also helped with the texturing. 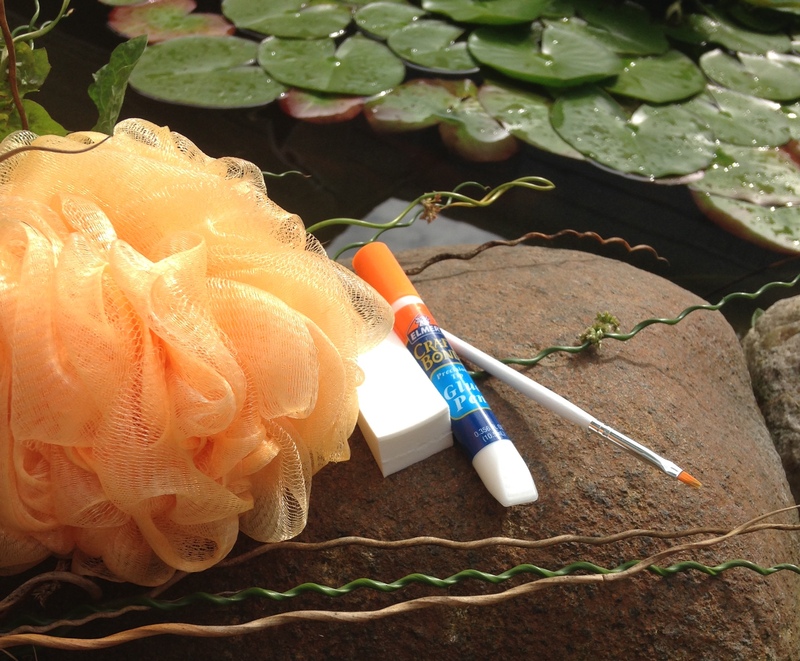 Here are the sponges and piece of scrunchie that I used. These items are easily found for under a dollar and last forever when you only need a little at a time. YIKES! Before clean up, this is how it looked. Remember, I painted glue on all of my fingers ahead of time, so I waited for the polish to dry and then plucked off the glue. Here are some of the glue bits. They all peeled off easily, and the next pictures I am going to show you are without any acetone clean up at all. While there are some spots that could benefit from a little tlc, overall I think you will agree that the glue was effective. Each hand is different, and honestly, each nail is different. I was pleased with how this turned out. 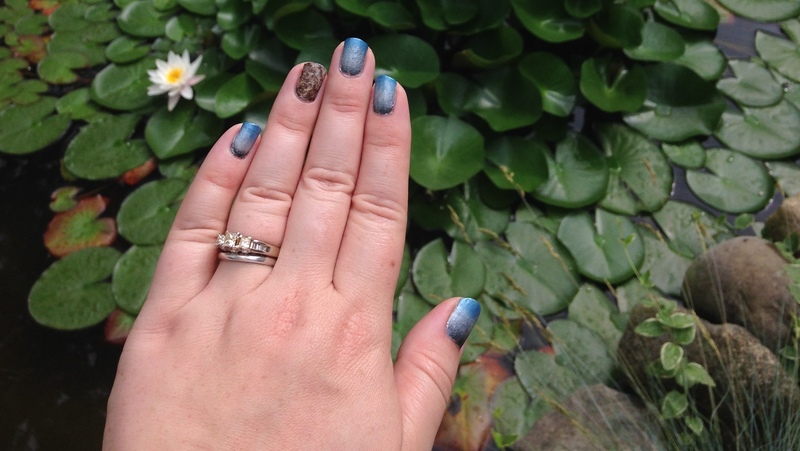 I think it stayed true to the Jurassic World color scheme and I think the dino skin accent nail isn’t too bad. 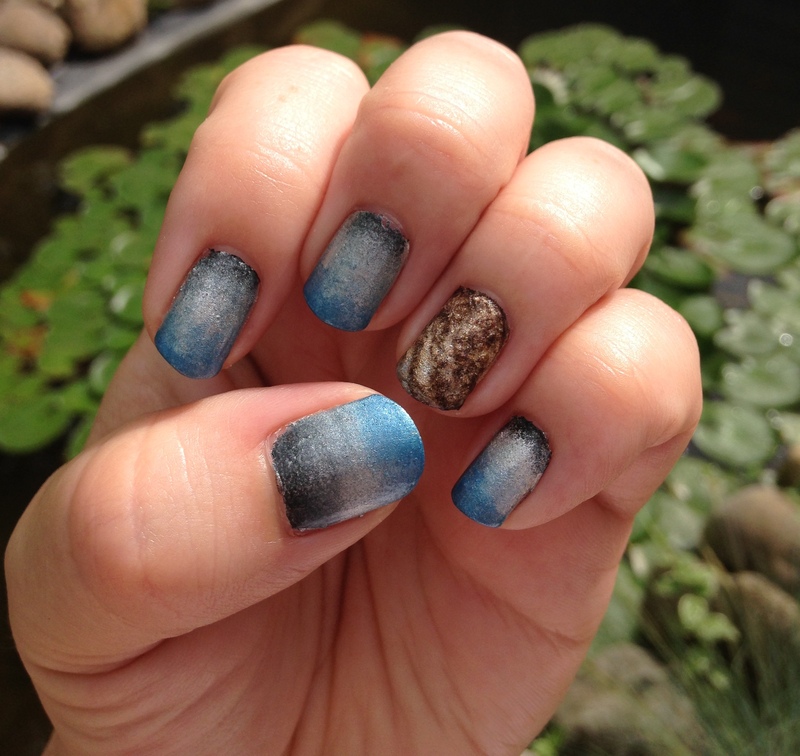 If you are looking for an easy way to clean up after gradient nail art, the glue thing works. Thanks for reading and indulging in my nerd of the week moment! 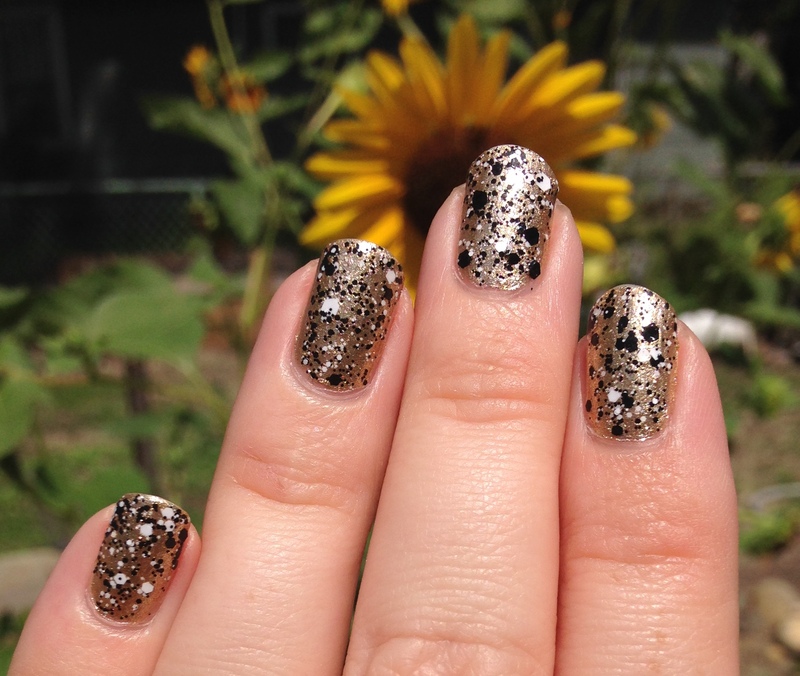 For this look I began with painting all of my nails in Sally Hansen Xtreme Wear Golden-I. It took two coats to make it opaque enough to move on. Then, I let that dry completely. Next, I crumpled up some plastic and painted China Glaze Turned Up Turquoise onto the plastic. 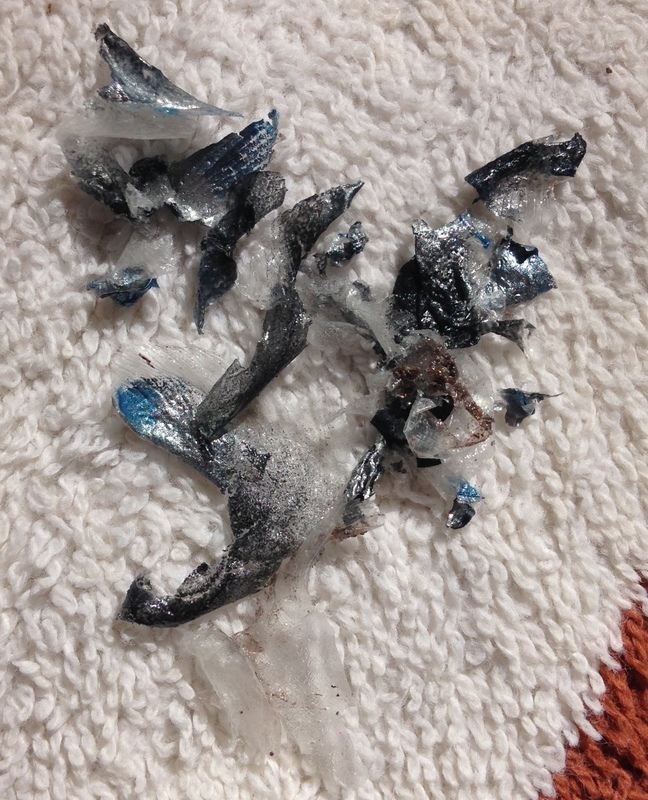 I then took the plastic and dabbed it all over my nails. This was certainly a mess and required plenty of clean up afterwards. Finally, I felt like the green had taken over, but I liked the antique look I was getting, so I crumpled plastic again and this time painted it with OPI Love.Angel.Music.Baby which has a satin finish, so it wouldn’t be as metallic as the Sally. I think that helped to balance out the colors and achieve what I was going for. Whether or not I fully achieved the antique look, I am not sure. I do think it is neat though, and would be interested in trying the plastic crumpling with other color combos. What combos have you tried? Any suggestions? As November ends, I was looking through my polish trying to find a nice mani to wear for all the family get-togethers this weekend. 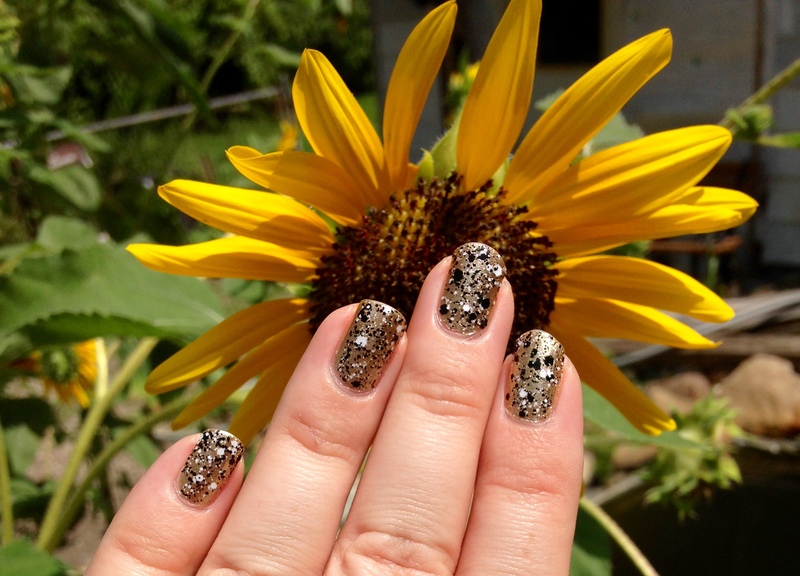 I truly love glitter in all things, but was trying not to be too flashy. I decided on golden nails. 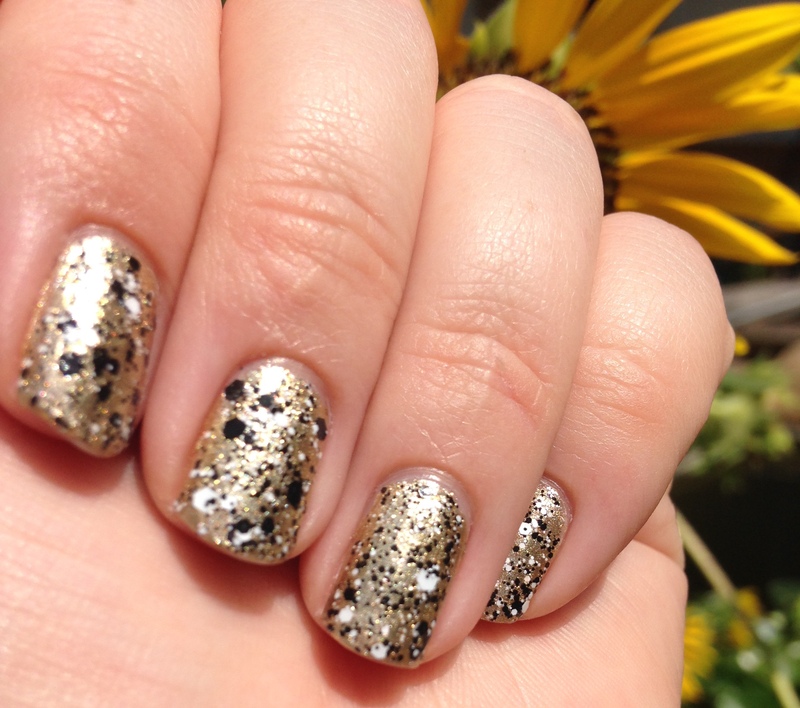 They can be sparkly and fun, but not over the top. 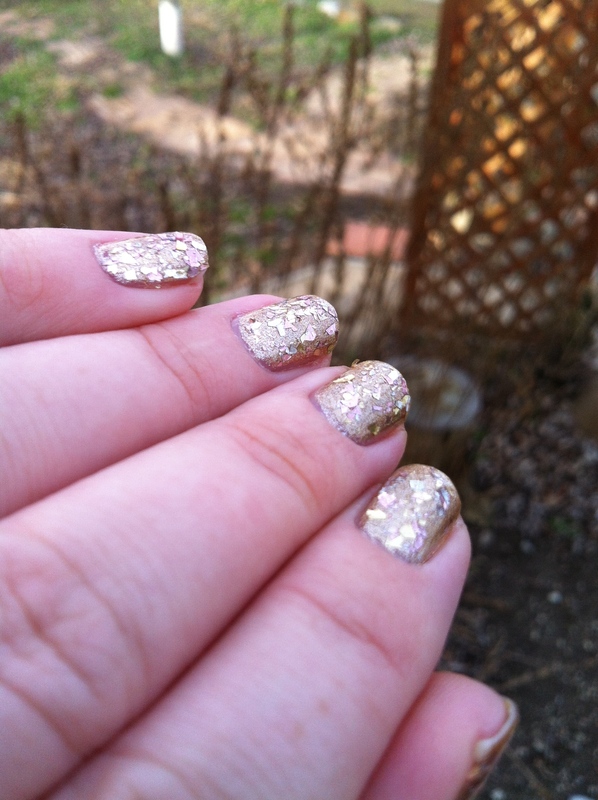 I topped my nails off with a layer of OPI Gaining Mole-Mentum, which is a flaky glitter polish that has gold, silver, and copper pieces. It catches the light without being gaudy. 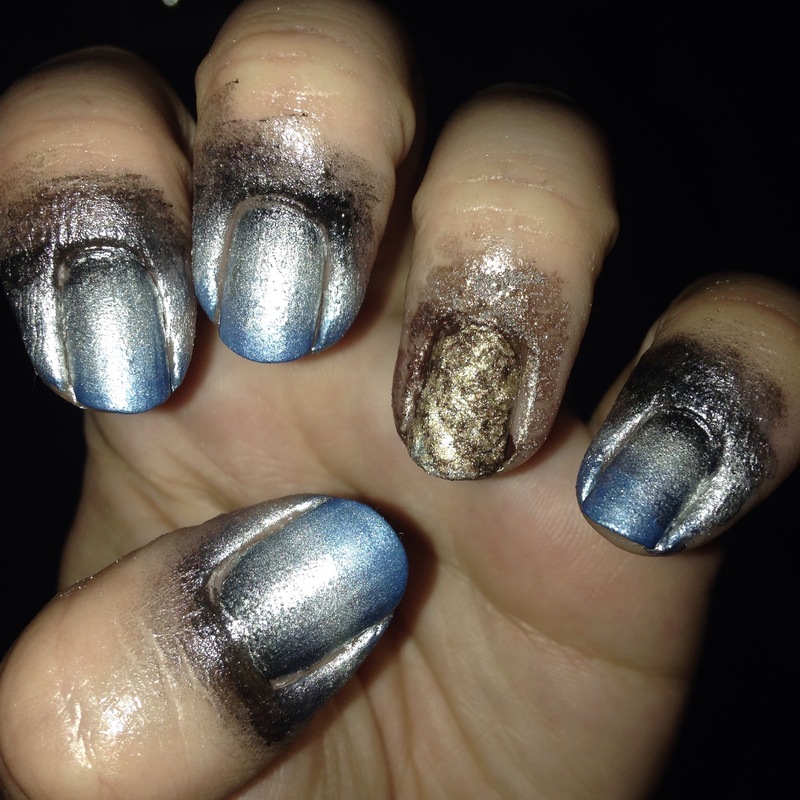 The finished product were cute, metallic nails, that have enough shine to keep me smiling, and are subdued enough to wear to any family member’s house. Thanks for stopping by! I hope you enjoyed it!